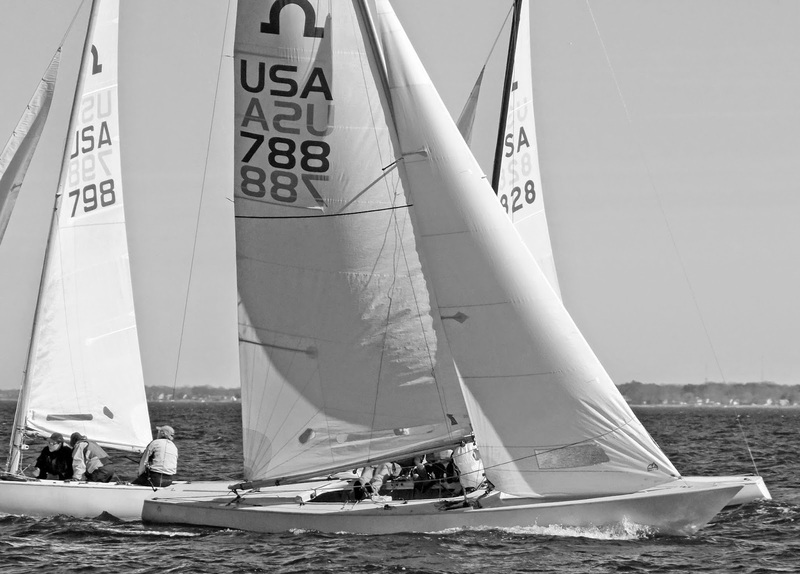 The My2Fish blog is about all things Sunfish sailing. On his blog you can find all sort of videos of Sunfish sailors and sailing (as well as some neat music videos). Just this time, let me trespass on My2Fish's subject matter with a great video of a father and daughter just kicking back and enjoying cruising their Sunfish over to some sand flats where they bother the seabirds and enjoy the simple fun of gunkholing. afternoon sail at the yacht club from Michael Bates on Vimeo. And if you can't get enough (like me) of the schmaltzy but, nevertheless, finger-snapping soundtrack of the Sunfish video; General Public's "Tenderness", here is the original music video. This is a glorious age to be poking around sailing history. Google's drive to digitize the world libraries has made it easier to settle in front of your computer and become transported back to another age. And in doing so I have realized how some history has not made it into the present age, or somehow has become distorted with time ---- see my post about who really designed the Star class keelboat. This is the case with Thomas Clapham, a designer and boatbuilder from the 1870's to early 1900's out of Roslyn, Long Island . Primarily due to the writings of Reuel Parker, a highly regarded designer and boatbuilder of classic cruising yachts, Thomas Clapham has not been completely forgotten in our time. Thomas Clapham is recognized today as the one who developed the cruising sharpie. Last year Reuel Parker wrote an excellent post about Thomas Clapham and his sharpies for Woodenboat online. 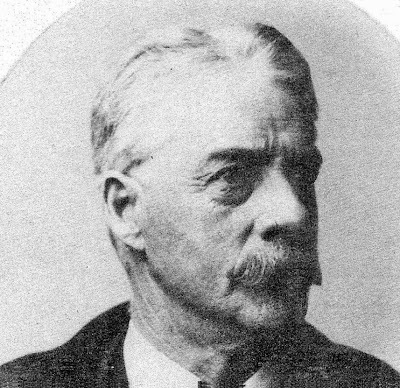 What has gone missing in our current sailing history is recognition that Thomas Clapham designed the first racing scow. Thomas Clapham figured out that the lowly scow, the ferry-boat and barge since Colonial times, the 16-wheeler of coastal trade, was the perfect rule-beater for the Seawanhaka Rule, a rating rule for sailboats that had come into usage in the early 1880's. The Seawanhaka Rule was a simple measurement rule; it measured waterline length and sail area and nothing else. If you had a shorter waterline you could carry more sail area for your measured rating than someone with a longer waterline. It is not clear how Clapham figured out all the benefits of the scow shape under the Seawanhaka Rule (a short measured waterline but long sailing waterlines when heeled, more power to handle the sail area as the center of buoyancy shifts to leeward when heeled) but he followed his instincts and, in the spring of 1890, built a 17' scow he was to sail singlehandedly (as he enjoyed doing), the Bouncer. 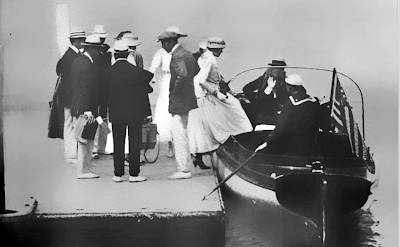 Clapham introduced his new creation for the cruise of the Corinthian Navy (a loose collection of what seems to be anti-establishment yacht club types throughout New York City and Long Island Sound) at the beginning of the summer of 1890 . The derision heaped upon Clapham was predictable as he sailed up in this strange, blunt, flat, low-freeboard, ugly, angular sailboat. "Barn door", "Pumpkin Seed", "A Cut-Down Bathtub". But on the last day of the cruise, a jaunt over to Glen Cove, this little scow outdistanced everyone, finishing with just one boat in sight. That Clapham was able to beat much longer keel boats with massive sail plans astonished everyone. The racing scow type was here to stay. In the spring of 1891, the Bouncer type had become a large part of Clapham's boatbuilding production with five on order. For 1891, Clapham had also designed a longer cruising Bouncer, a scow on which he had grafted a bubble type cabin-top. This he named the Chippewa model. 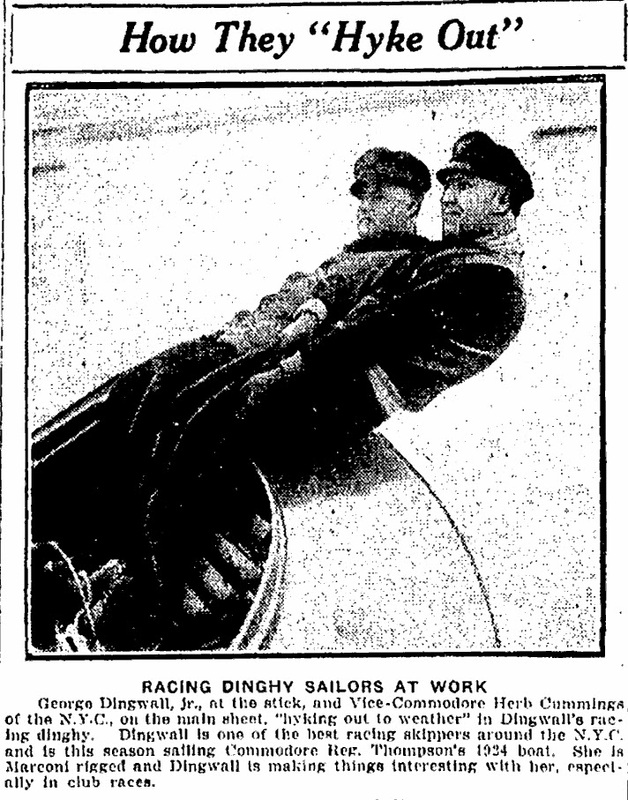 Starting in 1895, in the white-hot competition for the Seawanhaka Cup, the racing scow would be refined in a design competition between Canadian Herrick Duggan and a host of East Coast designers (including Clapham, Crane, Huntington, Cox, Mower and Herreshoff). In the third issue of Rudder magazine, C.G. 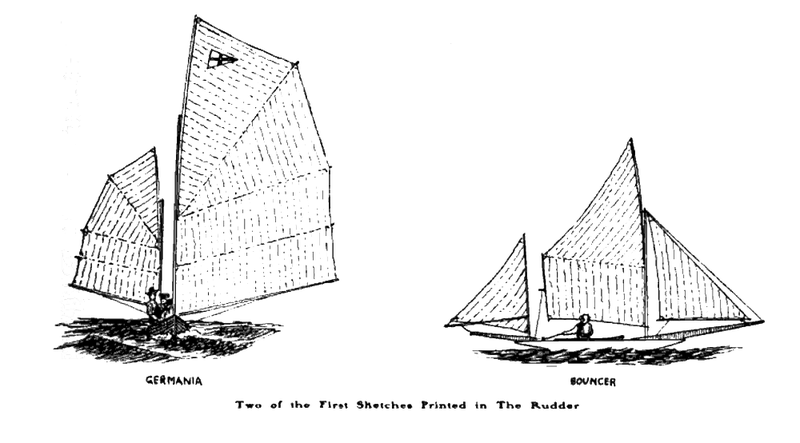 Davis sketched Clapham's Bouncer and Germania (this highlighted two very different approaches to speed in small 1890's sailing craft with Germania being a narrow canoe-type that most likely represented the 88-class St. Lawrence racing skiff) . 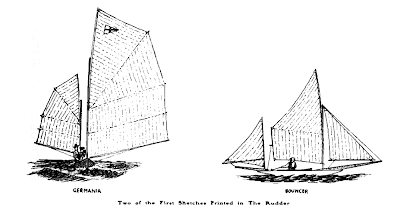 The first Bouncer had Clapham's favored Roslyn yawl rig though Clapham did build a second, longer Bouncer type in 1890, named Watermelon, with a sloop rig. "I think Thomas Clapham, right along with Nathanial Greene Herreshoff and Ralph Munroe, must share the title of “Father of the Modern American yacht”. Let me add that Thomas Clapham was the also the father of the racing scow. Click here for a post on Larry Huntington, whose scow Question got the scows going as the go-to design in the Seawanhaka Cup, starting in the mid 1890's. A quadcopter video of team racing in the 12' Firefly dinghies on West Kirby SC's Marine Lake. And, buried deep within Earwigoagin, here is another video on Fireflies. West Kirby Sailing Club from TCA Productions on Vimeo. I've mentioned this before but it's worth repeating; this blog is all about timeliness. I posted a header photo some time ago with keelboats running downwind under spinnaker but after I moved on to the next header photo I neglected to repost the previous one with a comment (as is my custom - not that anyone has noticed). This photo is from the race committee I did at SSA for the Soling fleet at the end of February. Luckily it was on the one pleasant weekend of a brutal winter with temperatures in the 60's (Fahrenheit) and a pleasant breeze of about 15 knots. Race committee consisted of two or us but the wind was so steady that we were able to set the course and forget it - just bang off a couple of starts. Some other photos I was able to snap from the stationary RC boat (since the starting mark was the leeward mark). Click on the photos to view in hi-res. My good friend Mike Waters had his spinnaker halyard jam while sporting a nice lead. He had to sail a fair distance off the course before his could get the spinnaker down. Sailing upwind into the winter afternoon sun. Just popping in for some rum. A group of mostly older Australian gents (one younger lass joining in) as they stop in at a nearby local yacht club (Royal Prince Edward Yacht Club) to unwind and enjoy some complementary rum (no better concoction for team camaraderie than a bottle of rum). Top Weight - A Day at the Races from mark callanan on Vimeo. Throwback Thursday: "How They Hyke Out"
From a 1925 edition of the Toronto Star newspaper. This image was lifted from the Classic International-14 blog. 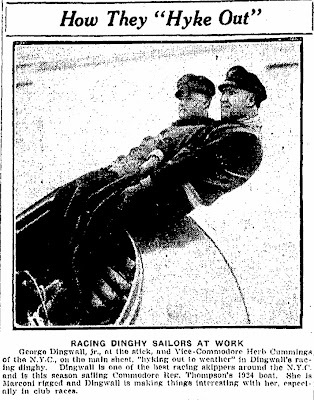 These gentlemen were racing the L.S.S.A 14, the precursor to the International 14 in Canada.